It snowed all day today in Pittsburgh. It’s not too deep outside. The snow is light and fluffy. I’ve already taken the top layer off. But it did keep me indoors all day. The snow plough passed through a couple of times. The snow closed around its wake and within a half an hour, the road was covered again. I share Ian’s frustration about the state of the country and discourse and what it will take to wake up the general public. But I’m not quite as pessimistic. We know what works. We have seen Republicans and then Democrats in 2008 (or were they really Democrats or just disaffected Country Club Republicans in disguise?) shape the narrative and drive voters towards it. The techniques for influencing people are the same whether they are liberals or conservatives. They are humans, herd animals and can be treated as such for maximum impact. It’s not really that difficult, provided you have a big microphone where you can amplify your message. The trouble is we tend to think of people with big microphones as those with the most money. This has proved to be the case in the past but it doesn’t have to be in the future. No one I know trusts the news, not even the ones who I feel are most influenced by it. What I have noticed is that the people most influenced by consensus reality are the least exposed to alternative voices. That sounds pretty obvious but the problem is that it getting the great sea of voters to hear differing opinions is going to take ingenuity, not money. As for revolution, I’m against violent revolutions but if there is going to be violence, it’s most likely to come from the people with the guns. That would pretty much exclude our side. Anyway, I’d rather try reason first before resorting to chopping off people’s heads. For example, when I post on policy advice to Hillary, I’d like to read about real ideas for policy. Don’t propose revolution until you’ve tried to solve a particular problem by proposing a real, thoughtful solution. In the meantime, might I suggest that the activists on the left concentrate on ensuring the integrity of the primary process in 2016. They should let voters make up their minds without interference or vote manipulation. If the left wants to change the world, it should start with shoring up its own moral authority. Where Hae Min Lee met Roy Davis? The corner of Essex Rd and Liberty Rd in Baltimore, MD. Katiebird is killing the world with Plague on her new iPad so I think I might have lost her temporarily when it comes to Serial. But there has been a lot going on lately with Adnan’s case against the slings and arrows of outrageous fortune so I’m doing an update and revising (slightly) my hypothesis on how Hae Min Lee died. First, a disclaimer: I am firmly in the “Adnan is innocent” camp. I haven’t seen any convincing or physical evidence tying Adnan to the crime. His conviction hinges almost exclusively on the testimony of a witness with a significant conflict of interest. What has been going on lately is that Rabia Chaudry, Adnan’s family’s friend, and former immigration lawyer, has been speaking at different law schools and universities about Adnan’s case. Just search “Rabia Chaudry” on YouTube and filter by upload date. There are numerous appearances to choose from. Her purpose is to keep the story alive while Adnan’s case winds through the appeal process. She is also raising money to hire lawyers and private investigators so Adnan gets an opportunity to mount a vigorous defense. The most significant outcome of the Serial podcast so far is that Adnan has been granted another appeal as a result of a hearing that happened last week. His lawyers were able to raise questions about the missing alibi witness, Asia McClain and whether Adnan’s lawyer effectively defended her client when she didn’t call Asia to the stand in the trial back in 2000. The appeal will be heard in June 2015. There are a couple of possible outcomes from the appeal. One is that nothing will change and the judges will rule against Adnan. The second is that he will get a new trial. That could drag things out a bit but I think by the time a new trial comes along, there will be enough evidence to show that the state doesn’t have a case against him. The third possibility is that the state could cut a deal with Adnan for something called an Alford plea. I think that’s a face saving deal for the state where they make the defendant plead guilty while maintaining his innocence. That could get Adnan released on time served but the conviction would still haunt him for the rest of his life. Rabia might be hopeful about this kind of deal but I wouldn’t want that hanging over my head for the rest of my life, especially because the case has been so public. People will always be wondering. As far as evidence goes, DC lawyer Susan Simpson has been ripping through the state’s case against Adnan. The case was based on cell phone records and witness testimony. That witness was Jay and his testimony is pretty worthless by now. You can find Susan’s invaluable analysis of the “evidence” against Adnan at her blog TheViewFromLL2. Susan is meticulous and thorough. She is able to pull apart the evidence in a way that Sarah Koenig and Dana Chivvas of Serial did not. That’s not to say that Sarah and Dana did anything wrong. They just had a different area of expertise. Susan has a very logical mind and she’s very good at data analysis. If I’m ever accused of murder, I want Susan as my lawyer. She doesn’t miss a thing. Ok, so on to my updated hypothesis of how the murder of Hae Min Lee happened. You can read about my initial hypothesis here. I am starting with the premise that Adnan is innocent and was unaware of any of the events surrounding the death of Hae on January 13, 1999. Additionally, I am also supposing that Jay also had nothing to do with the crime. He just happened to be on the cops radar for another reason altogether. Hae Min Lee is at the school until almost 3:00pm on January 13. She talks to several reliable witnesses who say they remember her being there. She speaks to her co-coach for the boy’s wrestling team who reports that Hae says she is not taking the bus to the wrestling match. She is driving herself there. She has other things to do in the meantime, the first of which is picking up her cousin from daycare. Hae leaves the school at about 3pm and heads to Campfield Early Learning Center. (Consult the Serial Podcast Locations map to follow the route). She can take two possible routes to get from Woodlawn HS to the daycare center. One is the Rt 695 main artery running north-south. The other route is the back way through a residential area. If we think back to the Serial episode on “Route Talk”, we may remember that the area between the school and Rt. 695 is congested at that time of the day. If you’re in a hurry, you’d probably want to stay clear of that area. It takes almost 20 minutes for Sarah and Dana to go about 2 miles. So, let’s assume that Hae took the residential route. Hae gets on Woodlawn Dr, makes a left onto Windsor Mill Road and a right onto Essex Road. That will eventually intersect with Liberty Road. Hae would stay on Essex and cross Liberty to get to the Campfield daycare. Along this route are two known addresses for Roy Davis. The first is at a place called Woodgreen Circle. Woodgreen Circle is a street behind Essex on the way to Liberty. The other known address is in the 7500 block of Liberty Road. This is where I enter the realm of speculation but that’s Ok because that’s all the cops have with regard to Adnan’s involvement so my guess is as good as theirs is at this point. I’ve tried to think of how Hae might have encountered Davis in this area and my best guess is that it happened in a gas station parking lot. I’m guessing that Hae was low on gas so she stopped to get some at the gas station at the corner of Essex Road and Liberty Road. There’s a Shell station at that corner along with some other stores. If you just want to get a few bucks of gas, you go in to the store to pay for the gas with cash before you pump it. Credit cards for high school students in 1999 are for emergencies only. I know because I had a teenager with a car living in my house back then. Maybe she didn’t make it into the store because the gas station attendants should have remembered her. Maybe Davis encountered her in the parking lot, forced her back into the car and took her on a drive. Did he pretend he was a full service attendant? Did she roll down her window? Did he threaten her? Catch her off guard? Smack her on the right side of her head with something to scare her? Does he force himself into her car? 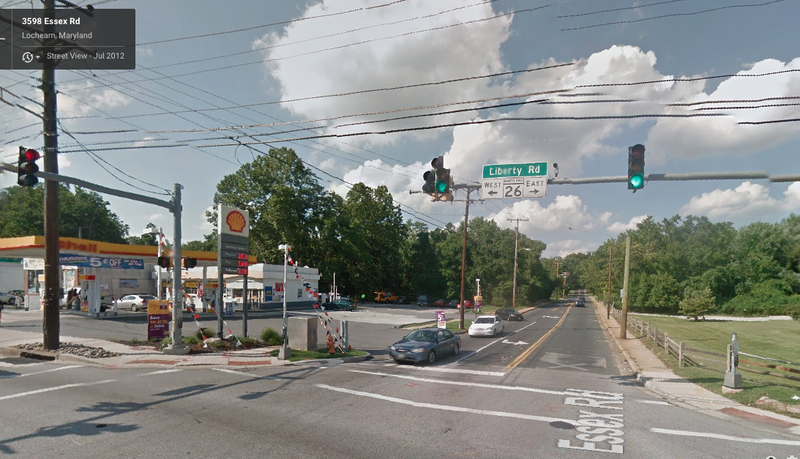 Somewhere between the corner of Essex and Liberty and the Crown Gas Station on the corner of Northern Parkway and Harford Road, Davis presumably killed Hae. If Davis wants to relive his previous experiences with Lambert, he heads east on Liberty towards Herring Run Park. He makes a left onto Northern Parkway. Then, after he kills her, he realizes that the car was almost out of gas so he stops to put a gallon in the car at the gas station at the corner of Northern Parkway and Harford Road. Otherwise, he’s got to get rid of the body and he’d be stuck in a stalled car at the side of the road. Someone might notice him walking away from the car that they later find contains a dead body. We can all speculate why he chooses to bury the body in Leakin Park. It’s closer to home if he’s going to have to ditch the car. Is there a bus route on Edmonson Ave? Yes, there is and several routes come off of it going north towards Davis’ home. There might have been too many people around in Herring Run Park to dump the body there so he found somewhere closer to home where the notoriety of leaving a dead body there would look almost commonplace. He leaves the body face down in the car, waits until later that night and buries the body in Leakin Park. Then he ditches the car on Edmonson Ave and takes the last bus towards home. I’m not the first person to speculate on this route or encounter with Davis. Reddit has a few adventurous types who stray far from the Adnan-Jay nexus of culpability. Koenig has probably thought of it as well. The reason why it has been underplayed may be that a.) Davis is still alive and it’s improper for Koenig to defame him before he’s officially a suspect (?) and b.) Davis is at the same correctional facility that houses Adnan and the last thing you want is for Adnan’s story to get the attention of a violent serial killer in jail with you. Yeah, that would keep me up at night too. Meanwhile, Deirdre Enright’s Innocence Project at UVA is sitting on a DNA request. They’re hoping that the samples are not contaminated and biding their time.